Around twelve years ago, two people had the blessed opportunity to marry their best friend. And so, with the blessings of God, the Ellis family was formed. Here you can see our four beautiful children. About five years ago, Jim was diagnosed with Polyarthralgia and a lung disease, both due to different types of chemical exposure during his years of military service. He was medically retired three years ago from the Army. Most days are absolutely wonderful; other days, he relies heavily on the sweet power of prayer. After several years of active health battles, Jim's health has become fairly stable as long as he follows the doctors' orders. About a year ago, we decided that we wanted to take the family on a trip across America, primarily to reconnect with our children after so many years of crisis, struggles, and sacrifices. What better way for them to learn, too? 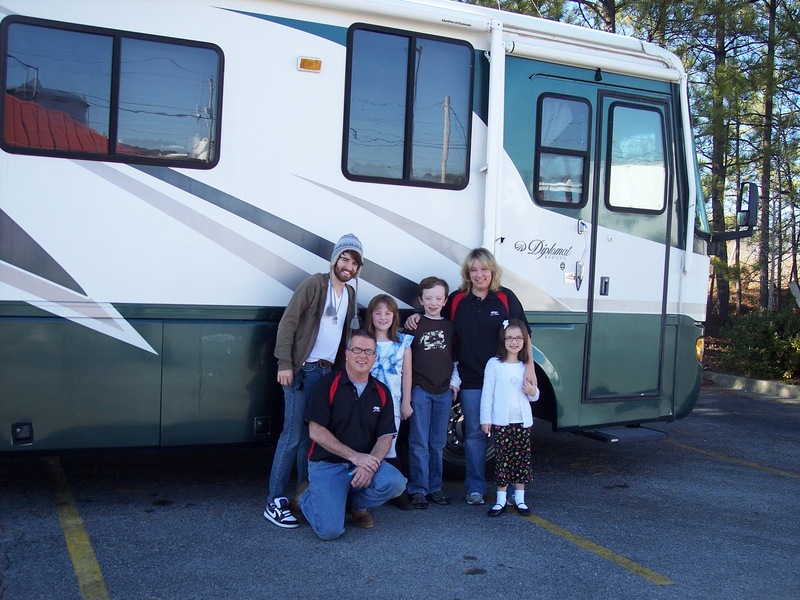 Since we have four children, and home schooling the three youngest ones, we knew we would need a full-size motorhome that would also accommodate Jim's medical needs. Well, God has really come through for us with the right motorhome, and He has guided us in working out all the details for our trip. We realize how blessed we are to have this opportunity and we are very grateful to God. Our circus crew at the circus! We are taking the trip of a lifetime - and there is no time like the present! We will take 18 months and travel the lower 48 United States in our 38' Monaco Diplomat motorhome. It is our desire to learn and grow as a family, while teaching our kids in a different and powerful way. History and culture will come alive in front of them, and it will stay with them for a lifetime. We are very blessed to be in the position to do this at this time in our lives. Jim: Retired from the military after 26 years. Joined the Marine Corps in 1982, and retired from the Army in 2008. Lisa: Primary occupation, Wife and Mom; Degree in Business Management from Shorter College, Web Design certificate from Sessions College for Professional Design; Home School Teacher. Michael: 10 years old, fifth grade; Funniest kid you'll ever meet. Rachael: 8 years old, third grade; Kindest and most loving little girl. Chrissy: 6 years old, first grade; Loving and very affectionate - funny little thing! Sam: the dog, not pictured. Jim and Lisa met at Lisa's nephew's (Andrew) 9th birthday party. Andrew and Taylor were best friends in the 3rd grade. Jim brought Taylor to the party, and Lisa served Jim cake. They started dating six months later, and got married three months after that. Michael joined them in 2001, followed by Rachael in 2002, and Chrissy in 2005. Sam joined the family in 2010. Jim and Lisa celebrated 11 years last December! Please tell us more about Taylor's beard!!! Can't wait to read about your family's adventure.